"is data about data, information about information ... More comprehensive definitions address metadata as structured data supporting functions associated with an object, an object being any “entity, form, or mode” (Big Metadata, Smart Metadata, and Metadata Capital: Toward Greater Synergy Between Data Science and Metadata). 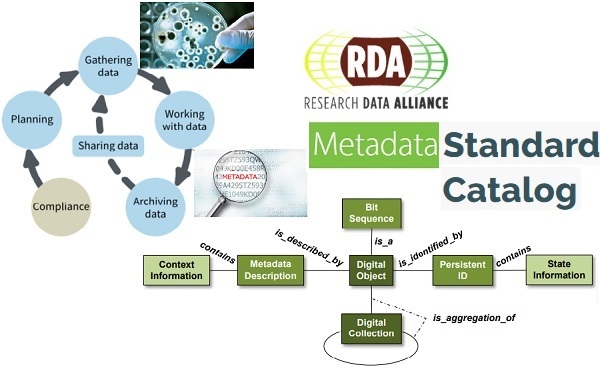 A major goal of Research Data Alliance (RDA) is sharing of research datasets. For this to scale beyond one researcher sending a dataset to another, interoperability is required using computer systems to discover, contextualise, select, access, transmit or process datasets. This interoperability is achieved through the use of metadata characterising the objects (datasets, software, users, computing resources) and techniques to match and map those descriptions leading to generation of convertors for the underlying data instances. Interoperation among many metadata models preserves the richness of the original schemes but uses techniques to establish relationships between attributes in the different schemes (matching and mapping). The common schemes can be generalised across multiple domains for each required purpose such as discovery, contextualisation or connection of a dataset to a software service. The MIG (Metadata Interest Group) proposes that these general, canonical, common schemes are called ‘metadata packages’ used for various purposes (discovery, contextualisation, provenance…). and which explains metadata in the perspective of Description, Discovery & Contextualisation of the most important elements of interoperability that define the syntax and the semantics for the research data exchange. Consider a LIBRARY CATALOGUE stored electronically. To a researcher it is METADATA – using the catalogue finds the book or article. To the librarian it is DATA: s/he can count how many books or articles exist on biochemistry compared with clinical medicine. In a VRE (Virtual Research Environment; e.g. BlueBridge VRE) the amount of work a researcher has to do manually just does not scale. Autonomic services are required. In order to achieve this DATA, SERVICES, USERS and COMPUTING RESOURCES need to be DESCRIBED to middleware which manages the scheduling, allocations, connection of the components etc. These descriptions are METADATA. Metadata for DISCOVERY (followed by manual selection and connection) is already achievable. However the selection of appropriate datasets (or software) is greatly enhanced by using CONTEXTUAL METADATA; that is metadata characterising the object of interest. Contextual metadata concerns PERSONS, ORGANISATIONS, PROJECTS, FUNDING, OUTPUTS (publications, products, patents), FACILITIES and EQUIPMENT – in short attributes which allow the end user (or software representing the end-user) to assess the relevance and quality of an object (dataset, software) for their current purpose. The mantra is formal SYNTAX and declared SEMANTICS. This allows machine processing rather than manual processing. Management metadata links with (3); the CONTEXTUAL METADATA can also be used for EVALUATION of research, policy-making and other management functions at institutional or funding organisation level. To learn about certain implications (with illustrations and examples) the above principles lead to, and about several use cases describing utilisation of a VRE with information at each step on the metadata required, you are invited to access and Read the full version of the RDA Metadata Principles and accompanying commentary (check principles in the attached document). You can track progress of a prototype RDA Metadata Standards Catalog by visiting the GitHub repository. The Catalog will be seeded with records migrated from the the Metadata Standards Directory (you can continue to add standards, profiles, tools and known users of standards). If you would like to help check, clean and expand the migrated records before they are loaded into the Catalog, you can find them in the 'db' folder on GitHub.